The White House screening came the day after Ohio’s governor signed a law banning abortion after six weeks – the fifth state to do so. The states’ actions have all been blocked by the courts, but pro-choice activists say that having Donald Trump and vice president Mike Pence in the White House, plus conservative Brett Kavanaugh on the Supreme Court has emboldened anti-abortion activists. Mr McAleer’s film, ‘Gosnell’, tells the true story of Philadelphia doctor Kermit Gosnell, who ran an abortion clinic. In the end Dean Cain, star of TV’s ‘Superman’, accepted the role – Mr McAleer said “he just loved the truth”. The success of ‘Gosnell’ has been followed by that of another film, ‘Unplanned’, based on the memoir of a former director of a US family planning service who became an anti-abortion activist. Meanwhile, Donald Trump has admitted he almost gave his daughter Ivanka Trump a job with the World Bank because “she’s very good with numbers”. 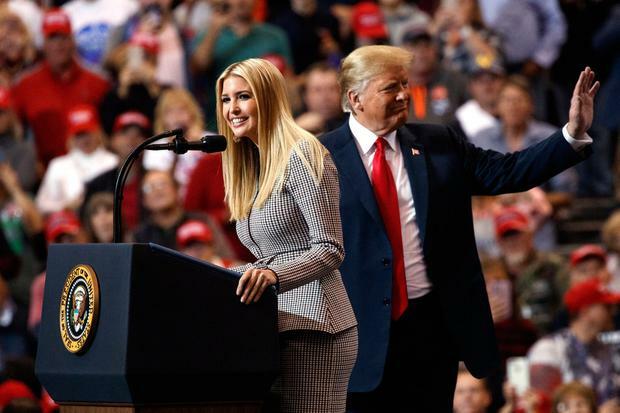 He decided not to proceed because if he had nominated his daughter (37) “they’d say nepotism, when it would’ve had nothing to do with nepotism. But she would’ve been incredible”. “I even thought of Ivanka for the World Bank,” Mr Trump said. “She would’ve been great at that because she’s very good with numbers. “She’s got a great calmness. I’ve seen her under tremendous stress and pressure.